It is Mother's Day and Dad, Sophie and Jake want to make Mum happy with special gifts they will make themselves. Baby brother clutches his teddy and watches the proceedings. After giving Mum breakfast in bed, they start on their gifts. Dad bakes in the kitchen, Sophie gets to work with paints and crayons, and Jake tackles making a photo frame. However, there is one other member of the family who wants to be part of the fun. Baxter, the dog, insists on lending a paw. "But what will Mum say when she opens the door?" is the refrain as Baxter destroys their efforts one by one, and the house gets messier and messier. When Mum gets up and asks, "Who made all this mess?" Baxter's furry coat covered in paint and cake is a big clue. Fortunately, there is time to get things back in order so that the messy Mother's Day can be enjoyed by all the family, including the culprit. Lucy Billingsley is a Sydney artist whose lively, large and bright illustrations are a good example of how pictures should interpret and extend the meaning of a picture book's text. I also like the cover's central raised illustration which is very tactile. The Messy Mother's Day's rhyming language, though lacking rhythm at times, is succinct and simple for reading alone. The fonts are large to match the size of the book, and some sentences swirl to match the exuberance of Baxter. 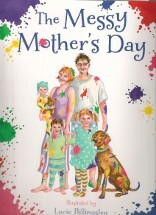 Primary age children will enjoy this contemporary celebration of Mum’s special day. You're right. The bright colourful illustrations and fun family story are exactly what mums need. Thanks for dropping by Buzz Words Books.